Chai Tea Sponge Cake with Vanilla Buttercream. I think I have probably mentioned before that I am real caffeine addict. I love proper barista coffee and if I have a latte I always ask for an extra shot! Unlike my son, who at 14 still doesn’t drink tea, coffee or even fizzy drinks, I have been drinking coffee since I was probably 2 or 3 years old. I distinctly remembering Mum making me milky coffee in the gas stove due to a power cut during the General Strikes of the 70s. Yes, I’m old enough to remember Mum wearing platform shoes and mile wide shirt collars. I was more of a Bay City Rollers fan and wore my tartan trousers with my yellow wellies and my Donnie Osmond flat cap! Well, I was only 3! Tea drinking has been a relatively recent discovery for me and I blame my Grandad for it. My Grandad was a character and a half but unfortunately we lost him 2 years ago to cancer. Grandad was a big tea drinker and being an ex-bricklayer, he liked it strong and sweet. To help my Nan out and give her a bit of a break I used to drive home to Worcester from North Wales. I would pack the car with all the cakes and soups that Grandad had requested during the week, add my son and my dogs and off we shot. As Grandad didn’t sleep well, he would quite often call for me in the night. Sometimes he just wanted a bit of company, sometimes for me to rub his back, sometimes he wanted a bit more morphine but usually he just wanted a cup of tea. Invariably by the time I had made it he had either nodded back off or had forgotten that he had asked for it in the first place! So my tea drinking started then! Well, waste not,want not! 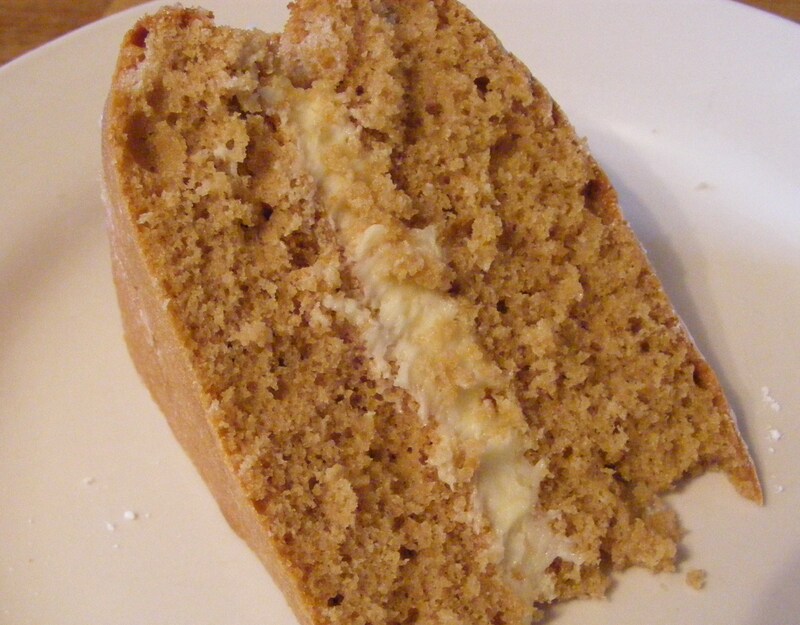 I have seen plenty of recipes for Earl Grey Tea cupcakes but I thought I would have a go at making a Chai Tea Sponge cake. It was a bit of an experiment but I am happy to say it was a complete success! Preheat the oven to 180°C (160°C fan). Grease and line 2 8 inch sandwich tins. Put milk into a saucepan and heat gently until the milk just comes to the boil. Add the tea bags, cover and allow to steep for at least 30 mins. Mix the butter and sugar together until light and fluffy. Add the latte powder if you want a stronger flavour. Add the flours and milky tea until the mixture is smooth. Divide the mixture between the tins and bake for 20-25 minutes. Turn out onto a cooling rack and allow to cool completely. Beat the butter, sugar and vanilla together until it is light and fluffy then use to sandwich the cakes together. Slice and enjoy with, you’ve guessed it, a cup of tea! Previous PostHow to craft a “Minecraft” Birthday cakeNext PostWhippet madness and a bit of Rocky Road!